This is the simulation of the motion of a mass m situated at the end of a spring of length l and negligible mass. The motion is restricted to the horizontal dimension. (We choose a coordinate system in the plane with origin at the fixed end of the spring and with the X axis along the direction of the spring). Measure the period of the motion for the given initial conditions. 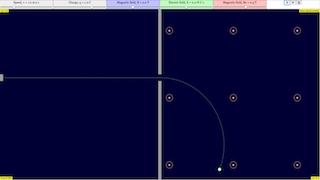 Drag with the mouse the ball to a new position and measure the period again. What do you observe? Set the mass of the ball to several different values (keeping k constant) and plot in your notebook the observed period versus the mass. Do the same for the elastic constant of the spring, k.
Would you dare to provide an explicit formula for the dependence of the period with respect to the mass and k? Should the total energy of the model be preserved?